OTELO, acronym for "OSIRIS Tunable Emission Line Object Survey", is a proposed GTC Key Project that will allow an optimal exploitation of the Spanish Day One GTC instrument OSIRIS, with a high scientific output and international impact. The survey will be made by using the Tunable filters, a unique feature of OSIRIS in 8-10m telescopes, to do co-mobile tomography at a depth allowing to measure the faintest emission line sources, while scanning a volume of Universe containing a statistical significant sample of such objects. With this technique, and given the high sensitivity gained by the use of the Tunable filters, OTELO will be the deepest and richest survey of emission line objects to date, providing an enormous amount of valuable data to tackle a wide variety of first ranked scientific projects. One of the OTELO science topics is its ability to detect H-alpha emission-line galaxies at z=0.24 and z=0.4. 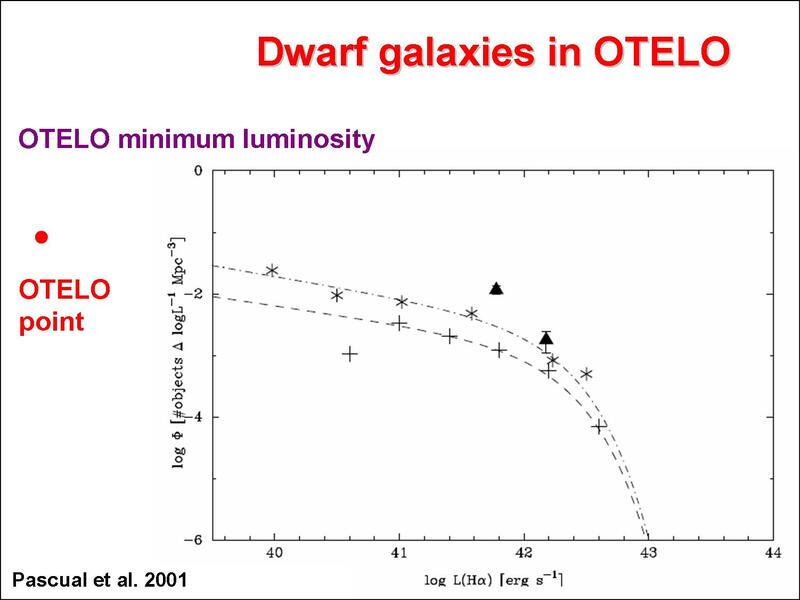 In this sense, OTELO will be unique providing H-alpha emitting galaxies several times fainter than those selected by surveys using classic narrow-band filters as Pascual et al. (2001). The OTELO PI is J. Cepa, and OTELO was selected a few years ago as key project at the Instituto de Astrofísica de Canarias. J. Gallego belongs to the OTELO IDT group. Simultaneously, Lucía Rodríguez is recognized as OTELO Ph.D. student under the supervision of J. Gallego. S. Pascual is considered as member of the OTELO invited team. More info about the OTELO project can be found at the oficial OTELO web page.